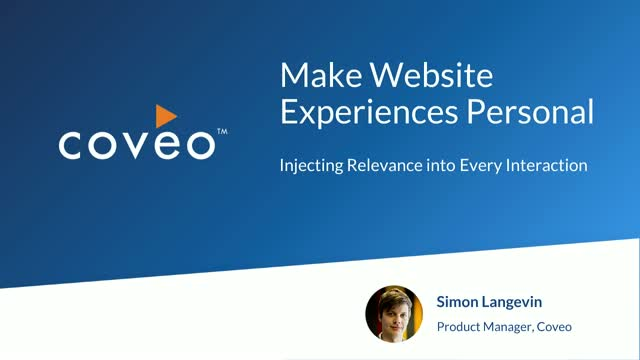 Manually personalizing your digital experience for every website visitor is near impossible. Having your team track, update, and deliver the most relevant content, the moment it’s needed, is just not feasible. This approach can lead to inconsistent and unreliable experiences for customers, places unnecessary burdens on marketing and web teams, and significantly increases cost of operation. Smarter, automated, and more scalable technologies are necessary to both satisfy today’s relevance-seeking customers and stay ahead of competition. You’ll also get a peek at AI-powered strategies that pacesetter companies are using to deliver relevance at every touchpoint. The customer community. Product information pages. Your website. The support site. How many different places do your customers visit when they are self-serving? Your customers are using multiple channels to find the information they need as part of one continuous self-service journey—and it’s time to approach your self-service strategy the same way. With so many touchpoints in different channels in the customer service journey, support leaders are faced with a unique challenge to unify the interactions and data in their self-service strategy to meet the demand for relevant and effortless experiences. - A process to create and reuse support knowledge and content in the flow of work and self-service. - A map of your support touchpoints and how they should leverage the context, information, and behavior other touchpoints are capturing in order to deliver relevant and consistent experiences. - Which metrics and KPIs you need to track for each channel to measure success and create a continuous cycle of improvement. The only way to create a truly relevant and scalable end-to-end digital experience is to unify every touchpoint across your organization and measure success. Insight Engines make that possible and are at the core of the digital transformation for today’s leading organizations. Many of which are already benefiting from significant business outcomes driven by relevant, personalized and contextual interactions. Insight engines will soon power the digital interactions of every employee, customer and partner, across industries and product offerings. It’s no surprise when it comes to resolving issues and finding information, customers prefer self-service. And organizations prefer it because it dramatically reduces support costs. But if you want to make great self-service a reality on your support portal, you need to give customers an intelligent and intuitive search experience and proactively recommend content that can help. Join us for this live webinar to learn the 6 best practices to increase self-service success & boost case deflection. If you’re a Customer Service Innovator, a Community Manager, or interested in the latest self-service trends, you won’t want to miss this info-packed session on the the power of AI-powered search to boost customer self-service. When it comes to creating transformative customer experiences, support leaders are often the ones responsible for justifying technology investments. But usually, this transformational journey reaches beyond the four walls of support and requires a holistic “all-in” approach across many departments and lines of business. The only way to create a truly relevant, scalable, and successful customer experience from end to end is to unify and measure it across every touchpoint. It’s time for support, marketing, education, and customer success departments to work together to make every interaction count. As explained by Gartner, "Insight engines apply relevancy methods to describe, discover, organize and analyze data to allow for information to be delivered proactively in the context of digital workers, customers or constituents." We believe they are at the core of the digital transformation for today’s leading organizations, many of which are already benefiting from significant business outcomes driven by relevant, personalized and contextual interactions. Insight engines will soon power the digital interactions of every employee, customer and partner, across industries and product offerings. What good is knowledge if it’s unused? And as your business scales, manually tracking, managing and surfacing the right knowledge at the right time can become a herculean task for your employees, and lead to customer frustration from a poor experience. Better days – and proven ways – are ahead. Listen to this informative and prescriptive on-demand webinar that will reveal ways to elevate your knowledge management game using the Relevance Maturity Model that has proved successful for TSIA member companies. How do you know if your customers are being successful on your self-service site? That’s the challenge support leaders are faced with when they attempt to understand knowledge usage, drive case deflection, improve experiences, and measure the ROI of their self-service programs. With many disparate systems in place, getting one consolidated view of what customers are looking for, and finding (or not finding) has been nearly impossible. Most common approaches involve a high degree of triangulation and assumptions - which doesn’t necessarily instill confidence in support leaders’ ability to report strong metrics. Listen to this webinar and find out what it takes to create and sustain self-service success. Focus on improving self-service is at an all-time high, with good reason: self-service is less expensive than other forms of support, and customers prefer it. But, is your self-service portal still making it too hard for customers? - Why you shouldn’t let roadblocks like information silos and ever-changing content stand in the way of delivering the self-service experience your customers deserve. As the pioneers of cloud-based AI-powered search and recommendations, we have always been driven by making the lives of our customers easier and the relationship with their customers more meaningful. Our mission is to transform your business by helping your organization to deliver more personalized experiences at scale, by ensuring that every customer, partner and employee has contextually relevant information at every touchpoint of their journey.